A warm welcome to our church website! We are so delighted that you dropped by to visit! 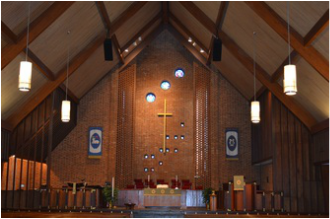 The gallery above gives you just a taste of life here at St. Andrew's UMC! If you'd like to visit, please see our church hours to the right. To know more, e-mail the Church Office. We'd love to help. St. Andrew's UMC. To see the April 2019 edition, visit ﻿here﻿. ﻿﻿Make disciples, follow Jesus, transform the world." Proceeds are donated to Camp Tekoa to provide scholarships for developmentally disabled adults to attend a week-long camp experience. Contributions also provide families an opportunity to attend the weekend family camp. Please keep Clancy's memory alive by helping others with your contribution to the fund. Please make checks payable to St. Andrew's UMC and mark the memo line "Clancy Fund". Thank you for your support. Visit here for our most recent volunteers are needed list. For the Financial Office's voucher request forms, please go to the bottom of this page. to live a life of discipleship. Thank you. The direction we believe God has given us is to grow into being a multi-cultural congregation. A one-mile radius around our building includes 4% Asian, 19% African-American, 42% White, and 32% Hispanic or Latino neighbors. We best re-present God's Kingdom and God's love when we are together. This is substantive work. We're getting better at approximating God's goal, but we're not there yet. We need to learn from people like you. We believe in the vision that Jesus gave us when he fed the 5,000, a vision in which we'll all be fed and healed at Jesus' feet together. We hope that we can partner with you in this work. on Good Friday. Tenebrae, which is the Latin word for “darkness,” is a service characterized by the gradual extinguishing of candles, representing the final journey of Jesus from the Last Supper to the cross. The clergy and choirs of St. Andrew’s UMC and SouthPark Church, plus special musicians, will lead us in a powerful journey of reflection through music and readings from the gospels. that will be in the Narthex on Easter Sunday morning. Thank you! THE CHURCH OFFICE WILL BE CLOSED EASTER MONDAY, APRIL 22ND. (Provided by the Charlotte Symphony Orchestra and the Charlotte Community School of the Arts) - Tuesdays and Thursdays, from 2:30 to 6 p.m. in Rooms #1 (the Commons Room) and #2 (Fellowship Hall). Volunteers are needed for snack/homework time from 2:30-4 p.m. on both days. We need three to four volunteers each day Snack donations are also needed for 50 children each day. Please bring snack donations to Room #16 (Pastor David Ortigoza's office). This year, please do not include Rice Krispies treats or candy in your donation. Please sign up from the donations list Here. Thank you for your support. Volunteers to prepare the weekly breakfast are needed. This program is a new beginning for Preschool and Parents with the St. Andrew's UMC Cross-Cultural Ministry. It is designed for children from 18 months to 4 years of age, and for their parents. Classes and Activities provided children: Crafts, Reading, Bible Stories, Drama, Music, and Cross-Cultural assimilation.Classes and Activities for Parents: Learning English, Prenatal, Marriage Counseling, Mental Health Care, and how to provide Nutritional Meals. A healthy breakfast and lunch is provided each Wednesday of the program. For more information, please contact Pastor David Ortigoza at 704-553-1327, ext. 107, or email him at dortigoza@wnccumc.net. Adult Community - Open Volleyball Night! on Wednesdays from 7:30 to 9:30 p.m. in the Family Life Center. All are invited to join in the fun! Bring a friend, neighbor! Child care not provided. For more information or to check their schedule, email Kevin Ward at kjw2517@gmail.com. Please click on the link above for more information about our worship services. St. Andrew's UMC is located between South Blvd. and Park Rd. South of Tyvola Rd. We are 5 minutes from South Park Mall and 8 minutes from South Mecklenburg High School. WOULD YOU LIKE TO RESERVE A ROOM AT ST. ANDREW'S UMC? CLICK HERE TO SET IT UP .